The trading of cards for business and personal visits dates back to the 15th century in China and the 17th century in Europe when cards were often about the size of a playing card, and were used to announce the impending visit of some member of the aristocracy. By the late 18th and early 19th century, the idea of calling cards became a tradition opted by the rising middle class where instead of an aristocratic title, a business title was substituted. Before the adoption of the computer for everyday business and the more widespread use of contact management software in the late 90's and early 2000's, business cards, business card filing systems, and business card books were the primary way to store and retrieve the contact information for your business contacts. The passing of business cards was always the start of any business meeting. So here we are rolling into 2015 and with email signatures, smartphones, tablets and even smart watches, one might wonder whether passing business cards has become...passe. But hold onto your rolodex! cards are every bit as important as they once were. Why? You never know when you'll be asked to talk about your business. Punctuating your killer elevator speech by handing over a great looking business card can help to make a more lasting impression. 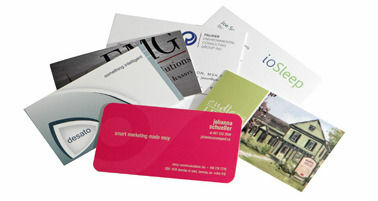 There are hundreds of options available to make your business card stand out and really speak to your brand. From die cut business cards that use shapes to help get their message across, to business cards created from custom materials, MLB has lots of options to help you make a strong first impression with your cards. Have you ever met someone that you didn't really want to stay in touch with only to have them pull out their phone so they can send you an email or text so you can stay in touch? Don't be that guy - Hand out a business card instead and when they hand you theirs you'll know that the door has been opened. If they don't hand you a card they could be out...give them our card. Have you ever been in a meeting or a business social event where you couldn't remember someone's name? Giving your business card to the people you meet in a business context gives them a quick reference should your name slip their mind and helps them avoid having to ask you again. 4. Do you want referrals? Sometimes the easiest way to make a referral is by the sharing of business cards. Have you ever said or heard someone say "I think I have their card right here..."
Business cards can be stapled to brochures, attached to gift baskets, handed over at meetings, inserted into folders, passed on to colleagues, entered into your CRM, and filed in a rolodex. Business cards can remind, refer and perhaps will be the call to action that will help you land your next biggest client. From custom materials, shapes, and layout, MLB Print Management can give you the options that will help you make a great impression with your business cards.